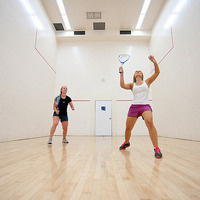 The Racquetball tournament will be held on Saturday, February 16th on Dixon Racquetball Courts. The meet will begin at 11:00am. Register online through IMLeagues by Feb. 15th by 2:00 pm. Check-in begins at 10:30am. The meet will begin promptly at 11:00am. Please arrive early to allow enough time for check-in and warm-up. The tournament will begin with pool play, and the top participant(s) from each pool advance to a single elimination bracket. Participants are guaranteed at least three matches. Intramural Sports Champion shirts will be awarded to participants with the best record in the Women’s and Men’s division. Individuals will purchase an IM Pass for $20 per term to play unlimited Intramurals (player eligibility rules will still apply). All participants must create an IMLeagues account and have an active IM Pass to be eligible to register for intramural sport leagues, tournaments, and events for that term. Log into IMLeagues from the OSU Rec Sports website to create an account, obtain an IM Pass, and register for intramural sports!